Priding itself as a family orientated company with the emphasis of safety at the heart of its operations, our Victorian based customer for over twenty years has been at the forefront in the supply of asphalt and road base aggregate materials. For many years, the production plant implemented a very old primary belt cleaning system. Normal wear and tear resulted in weakened tensioning and pressure on the conveyor belt. The uneven pressure significantly reduced the overall cleaning effectiveness of the belt cleaning system which required rectification. 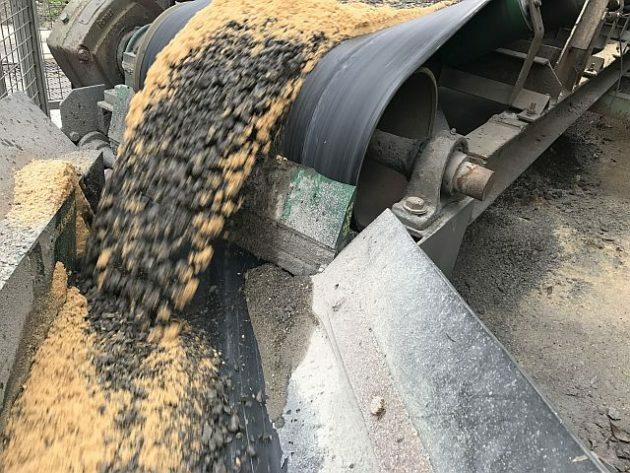 Carry back and the accumulation of conveyed materials on the conveyor belt return side was also a major concern as this raised issues of excessive material spillage, production down-time required to conduct manual cleaning and escalated safety hazards associated with excessive material spillage. Kinder Australia’s team of highly technical, field application specialists conducted a comprehensive review of the operations existing conveyor system. The review addressed key areas of belt cleaning and included the recommendation of a solution to improve operational productivity and minimise safety hazards on site. The small diameter of the head pulley was identified as a key factor in recommending Kinder Australia’s Micro Eraser™ Primary Belt Cleaning solution. Lightweight, durable and high strength, this compact primary belt cleaning system delivers a highly powerful and proven cleaning performance. The single pin blade attachment means quick and simple blade change out with minimal production down time and no rusty bolts made the installation process timely and efficient. After numerous months of constant use, Micro Eraser™ continues to deliver excellent ‘faultless’ belt cleaning performance, well beyond our expectation. The Micro Eraser™ installation successfully tackles carry back issues, which in turn has assisted in keeping belts running true, material spillage has also been eliminated and safety hazards are well under control. Maintenance team were also pleased to report blade wear on the Micro Eraser™ is virtually non-existent and no additional belt cleaner tensioning adjustments were needed since installation, further demonstrating the power, endurance and effectiveness of this mighty Micro Eraser™ Primary Belt Cleaning System.